Dislocated (allochthonous) megablocks are characteristic of impact structures and are understood to be related to the different stages of impact cratering (excavation, ejection and modification of the transient crater; see Melosh ). Thorough mapping within the Azuara structure (Bärle, 1988; Fiebag, 1988; Gwosdek, 1988; König, 1988; Linneweber, 1988; Waasmaier, 1988; Hunoltstein-Bunjevac, 1989; Müller, 1989; Katschorek, 1990; Mayer, 1991) has revealed a large number of dislocated megablocks. Gravity gliding can in most cases be excluded as an explanation, and the rootless layering of many megablocks has been shown by geophysical measurements (Bärle, 1988, König, 1988). 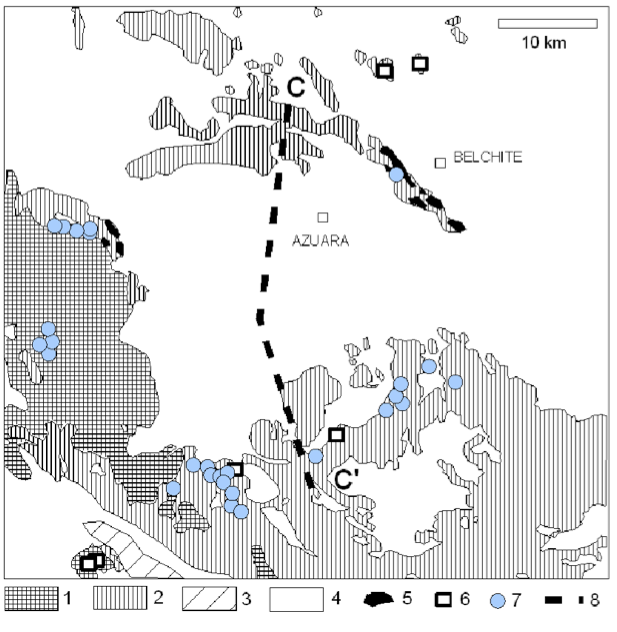 A location map for allochthonous megablocks is given in Fig. 5. UTM coordinates of typical locations are: 6 67 350, 45 47 790¸ 6 70 140, 45 47 790; 6 70 390, 45 47 520; 6 77 660, 45 45 700; 6 88 850, 45 60 000, 6 69 760, 45 45 470. Fig. 1. Location map for dislocated megablocks (7, blue) in the Azuara structure. Modified from Ernstson et al. (2002). Fig. 2. Allochthonous 150 m-sized Paleozoic megablock (dark) overlying and indenting Cretaceous Utrillas layers (light). The Paleozoic is completely isolated and is surrounded by a Mesozoic curtain of at least 4 km width. 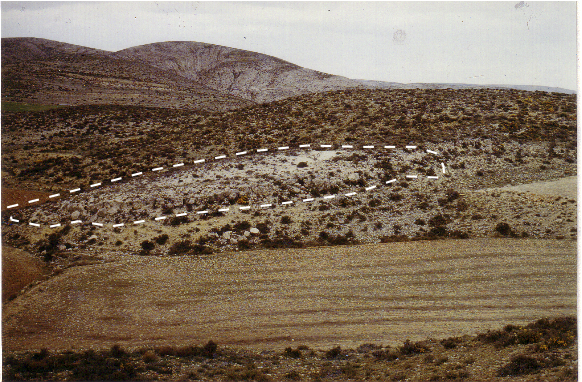 Azuara impact structure, SE Monforte de Moyuela. Fig. 3. Allochthonous megablock (as marked in Fig. 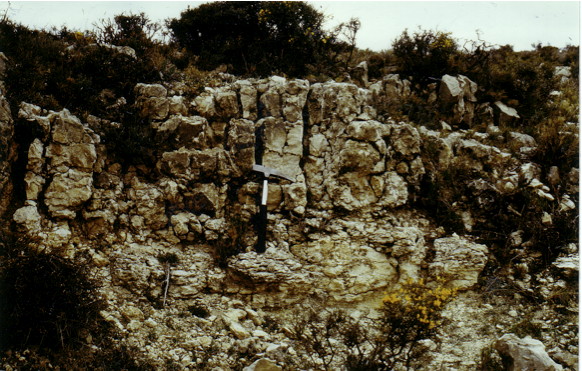 4) wedged in Malmian limestones. 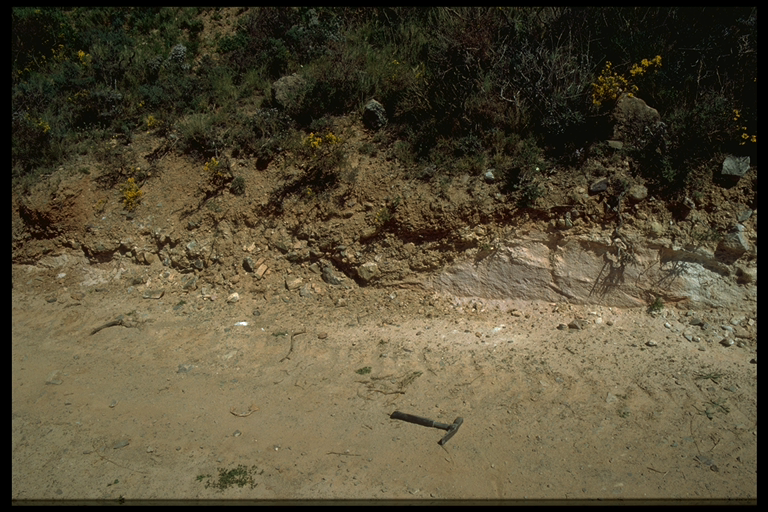 Azuara impact structure; Barranco de Muniesa. The field is about 100 m wide. Fig. 4. Allochthonous megablock wedged in Malmian limestones. Fig. 5. 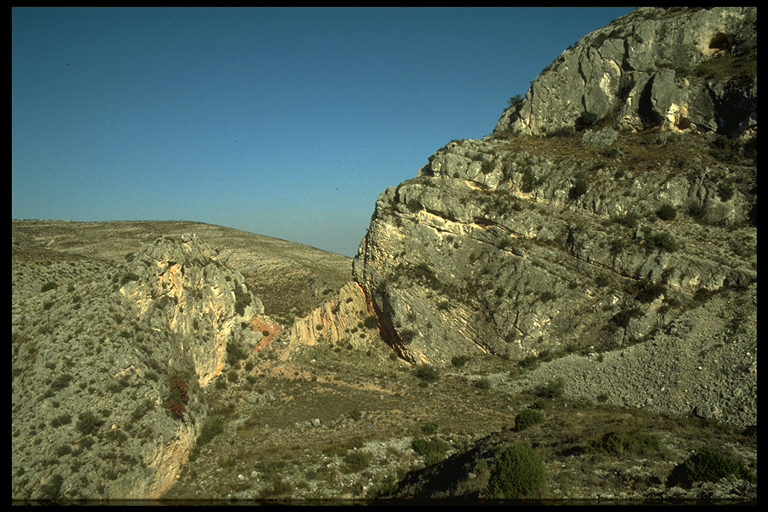 Allochthonous megablock (encircled) of probably Malmian limestone south of Blesa. Fig. 6. Detail of the allochthonous megablock in Fig. 5. Photographs S. Linneweber.